Just who is the 19-year-old Juventus striker who claims to be stealing all of Cristiano Ronaldo’s football “secrets”? Ronaldo scored the away goal that puts Juventus in charge of their Champions League quarter-final against Ajax, and is likely to be the centre of attention at Tuesday’s second leg in Turin – but watch out for Moise Kean. Kean was born on 28 February 2000, in northern Italy to Ivorian parents, and spent six years in Juventus’ academy. Even before he made his senior breakthrough, he was making an impact. His total of 24 goals in 25 games for Juve’s reserves during the 2015-16 season led to reports of interest from Manchester City boss Pep Guardiola and from Arsenal. 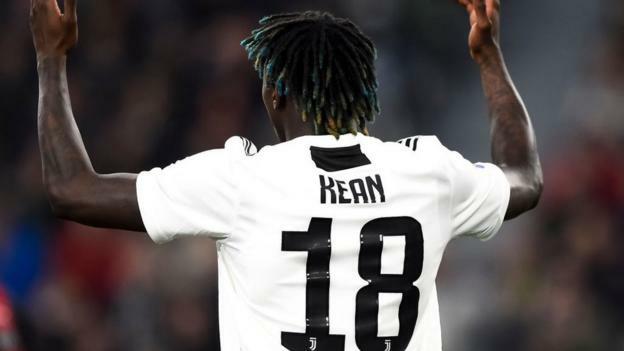 At 16, Kean was offered a professional contract by Juventus. On 19 November 2016, he became the club’s youngest first-team debutant, aged 16 years, eight months and 23 days. As French football journalist Julien Laurens told BBC Radio 5 Live’s Euro Leagues Podcast: “I think the loan spell did him so good at a young age. “I learn from Cristiano Ronaldo in training; I steal his secrets,” said Kean earlier this year. “I always try to be ready and train regularly so that I’m prepared when the time comes. As Italian football expert James Horncastle told BBC Radio 5 Live’s Euro Leagues Podcast, Mancini has called heavily on the Italy side who were runners-up to Portugal in the Under-19 European Championship last July. “This is an Italy side that wants to play passing football, that wants to be on the front foot and that doesn’t believe you will get anywhere by looking to defend and pick teams off on the counter-attack. Mancini’s faith in players such as Kean seems to have paid off. Italy have won their past three games under the new boss and are unbeaten in six. “Kean took the opportunity with two hands,” said Horncastle. “There was something wonderful about the goal against Liechtenstein. Kean’s development with club and country owes a lot to Balotelli. The former Manchester City striker attracted a fair few negative headlines in England – for incidents such as throwing darts at a youth player and accidentally setting his bathroom alight with fireworks. But he has been a positive influence on Kean. “Kean has spoken a lot about his interactions with Balotelli and about his experiences,” said Horncastle. “There are 10 years between them and Balotelli has told him not to make the same mistakes that he has. “The emergence of Kean has been politicised. In Italy, the citizenship laws are discriminatory essentially. If you are born and raised of parents who are not Italian, you have to wait until 18 to be named an Italian citizen. Kean’s agent, Mino Raiola, has also encouraged the striker to learn from Zlatan Ibrahimovic, and Ronaldo’s influence on the training ground has already proved a big factor in his development. Horncastle says Kean has described Juventus as “a University of Football” given the wealth of talent there and he has disregarded interest from Ajax and AC Milan as a result. Kean, who has six goals and one assist in Serie A this season, has been compared to his hero Balotelli – matching strength and power with pace and intelligence. Juventus boss Massimiliano Allegri has recently said Kean “needed to stay at Juve to grow technically, train and play with the champions, but to improve mentally”. He said: “You have to look at the precociousness of this kid in terms of his development. It is really astounding.